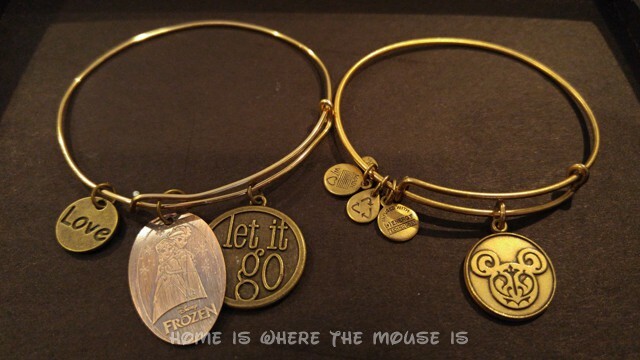 Alex and Ani bracelets have become one of the go-to gifts for Lisa for just about any occasion. She can’t have enough of them, especially the Disney bling. 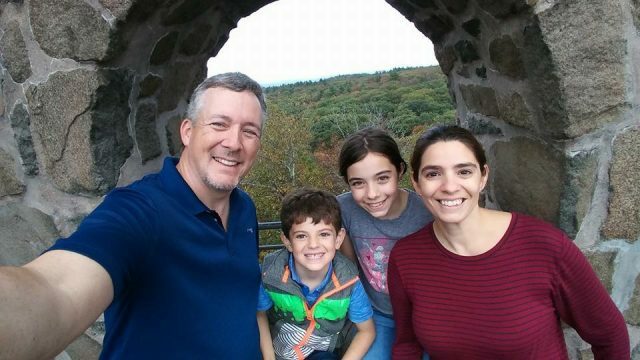 Our daughter would also love to have some of her own. 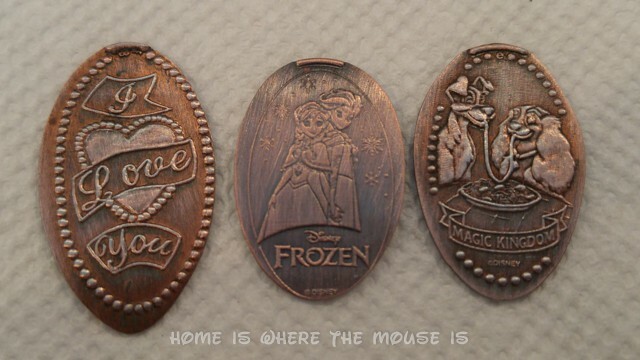 So, I thought I would try to make my own, using Pressed Pennies we got from our Disney trip as the charms. Not only would it be an interesting twist on the bangle bracelet idea, but it could also be a way to make some fun bracelets in Bella’s size without breaking the bank. 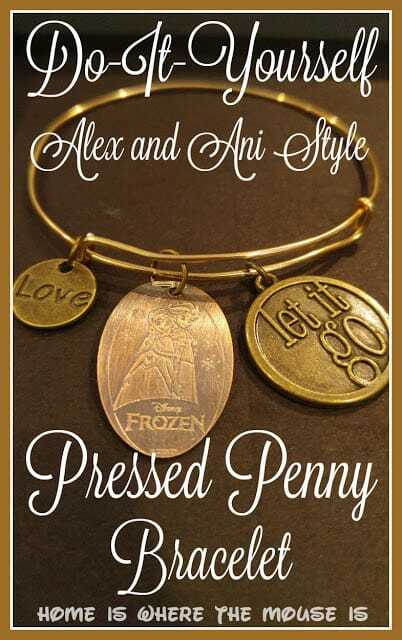 Here’s how it went: I had actually seen an Alex and Ani style bare bracelet in one of our local craft stores months ago. When I went back to pick it up, I couldn’t find it. So, I figured I would start from scratch. 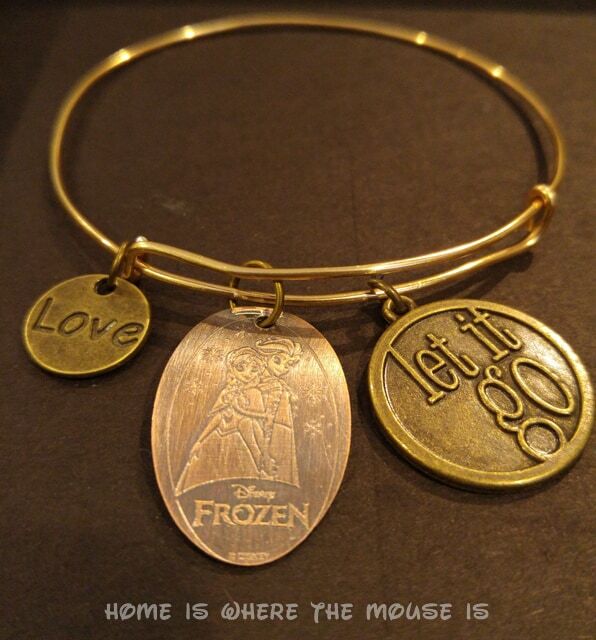 For this bracelet, I was shooting to make it as close to an original Alex and Ani as I could get. 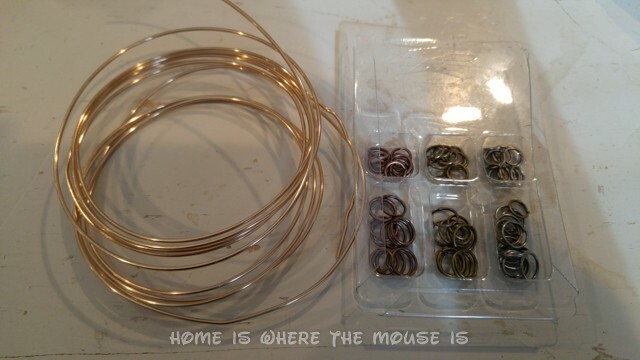 Jewelry Wire comes in different colors, thicknesses (gauges) and softness (how easy it is to bend and shape). 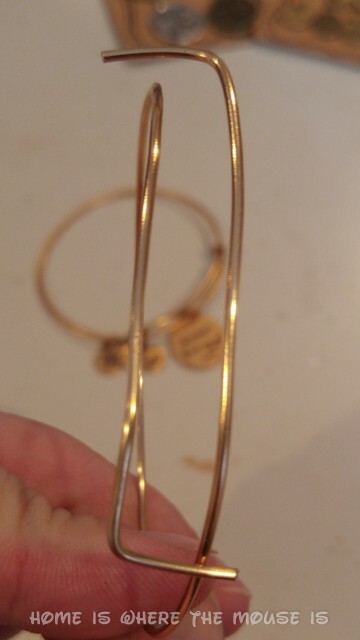 I didn’t have one of Lisa’s bracelets with me at the store, so I chose a gold colored wire. It only came in 16 gauge, which is a little thinner than her other bracelets. 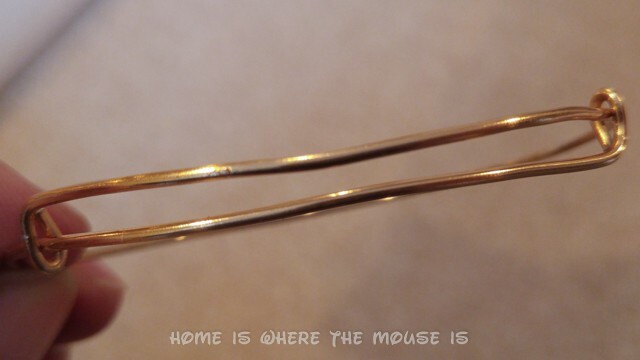 It is also “dead-soft” which means it is very easy to bend and shape. Based on how this project came out, I’m going to try for 14 gauge “half hard” wire on the next one. I bought a package of assorted jump rings. My thinking on that was perhaps I’d make a silver or copper bracelet if I didn’t like how the gold turned out. 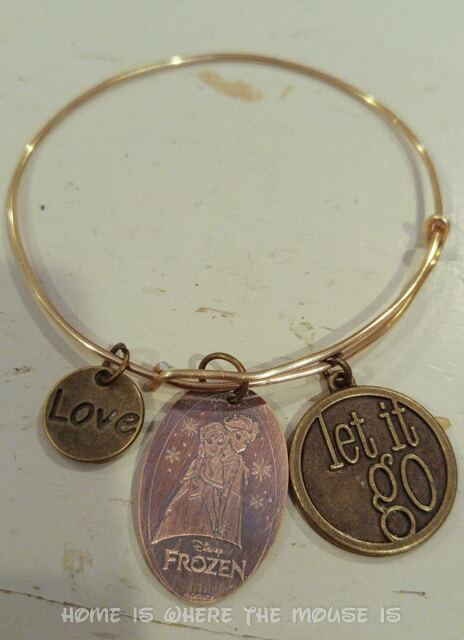 I didn’t expect to find any Disney charms, but I happened to notice the “Let it Go” charm and couldn’t pass that up. 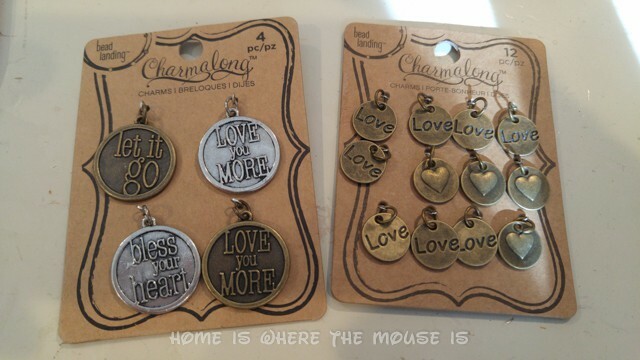 With Valentine’s Day in mind, I grabbed the smaller charms that each said “love” on one side and had a heart on the other side. For my pressed pennies, I decided to try a Patina solution to darken them. I submerged each in the solution for a minute or two, then used the rough side of a kitchen sponge to rub off the patina from the raised parts of the pennies. I think they came out okay. The “I love you” penny wasn’t from Disney. I believe that came from a rest area from one of our road trips. 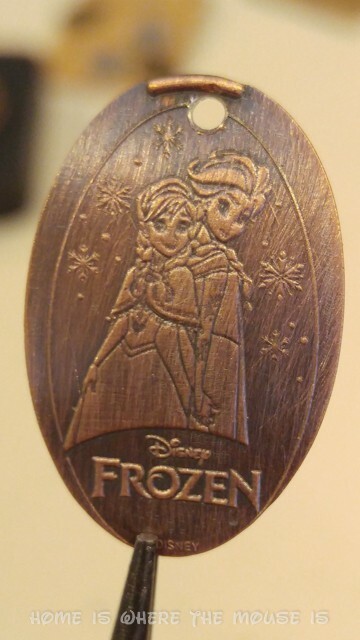 You’ll also notice the Frozen penny doesn’t have as much contrast as the other two. This was because the imprint wasn’t raised as much. 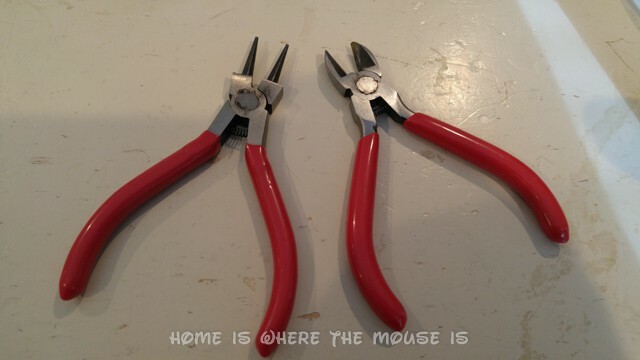 I used these rounded nose pliers for bending the wire and the wire cutters to cut the wire. Another tool I picked up just for this project was this metal punch to make the holes in the pennies. 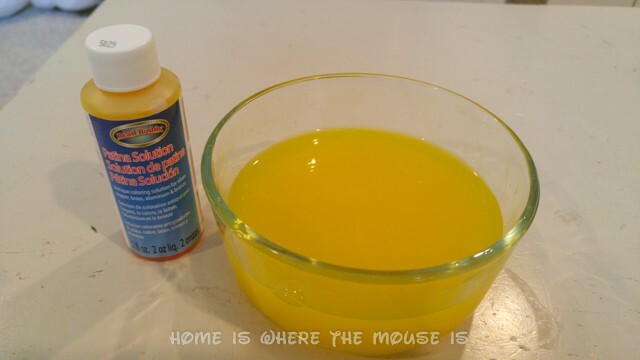 Somewhere in the house I have a small drill that looks like a screwdriver, but I couldn’t find it. I thought a power drill would have been overkill. I also picked up a rubber damping pad for “work hardening” the wire. The rubber mallet was one I already had. The work hardening didn’t go as well as I had hoped. It might be because of the large mallet? Perhaps I should have splurged on the smaller mallet at the craft store. 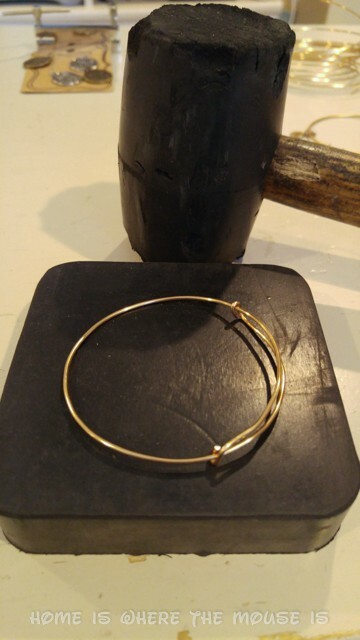 Using Lisa’s bracelet as a guide, I cut a piece of wire to about the same length. I went a bit longer, since I would need to bend the ends to create loops in the next step. Where the wire overlaps itself, one side becomes the top and the other the bottom. 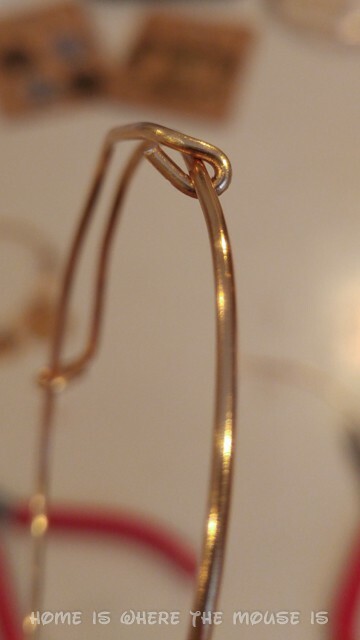 The ends need to be bent toward the other wire, so they can then be looped around it. This is where the rounded nose pliers came in handy. I held the wire with my fingers at the base of the 90-degree angle I made, then used the pliers to loop the end back over to meet that point. Then I squeezed them together. The loops create a gap between the wires, but also allow the wires to slide through the holes. This makes the bracelet expandable. Too large a loop and your gap will be too wide. 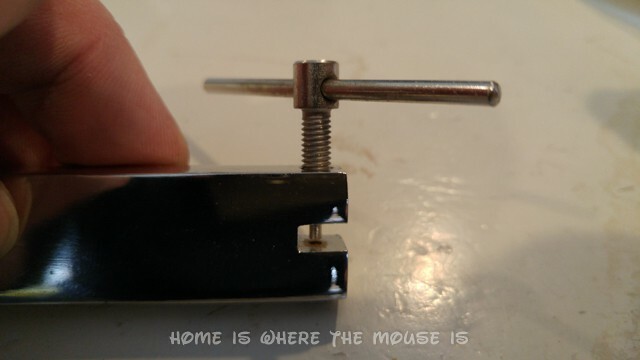 If you try to use a smaller loop, you it may be too tight and prevent the wire from sliding. I unscrewed the punch using the handle until I had a gap wide enough to slide the penny in. Once I had it lined it up, I tightened the punch down until it had caught the penny. Then I used one hand to hold the body of the tool while turning the punch a few times to create the hole. 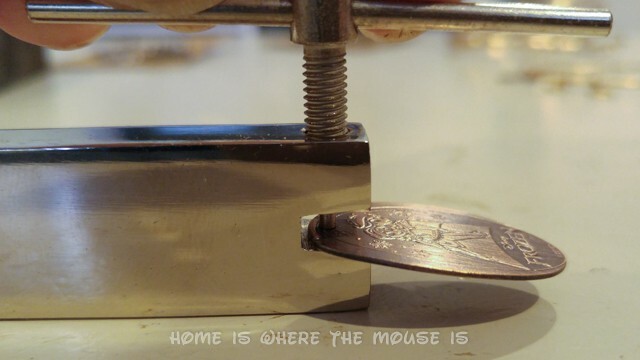 I chose a small jump ring and used the rounded pliers to pry it open enough to slide through the hole in the penny and attached it to the wire. The other charms came with their own rings, so it was just a matter of opening them up enough to add them on. Using Lisa’s bracelet as a model, I put the large charms between the wire loops I made. I attached the smaller charm on the outside. Overall, I was pleased with how it came out, especially considering it was my first time doing this. The softness of the wire was a problem, and I made some attempts at “work-hardening” the wire to make it stiffer. That’s something I will have to improve for the next ones. 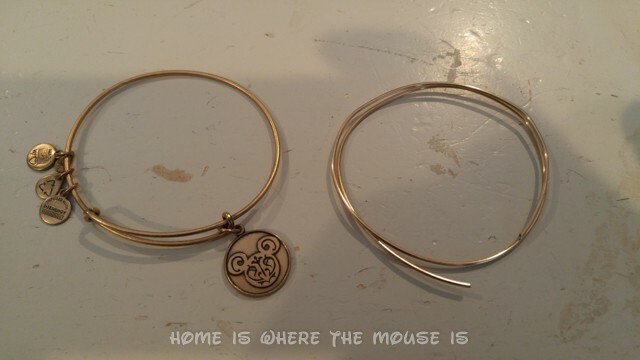 Here’s a side by side comparison of my bracelet and an official Disney Alex and Ani bracelet. Mine ended up being a bit larger and a little thinner. It’s also not as straight as I would like it to be, due to the softness of the wire. Despite the minor flaws, I think they make good additions to Lisa’s bangle collection. Now to make some smaller ones for Bella. What do you think? I would like to try a silver one, but I’m thinking the pressed quarters I have might be too big to use as charms. I’ll keep thinking about that and let you know how it goes. What a great idea! I’m impressed with the finished bracelet! Super-cute bracelet!!! Where can I get a metal punch tool? Hi Heather! I picked up my metal punch tool in the jewelry section of my local craft store. We have Michael’s and Joanne’s near me. You could also order one from Amazon. I love this idea. My cousin and I are taking out kids I think this would be a great gift to make for her later. Have a great time! We use M&M tubes to carry our quarters and pennies for the machines at the parks, and you can find sites like presscoins.com that list where to find different pennies in the parks and resorts. Your soft wire bracelet looks much better than the one I made with half hard wire. My wire was too hard to bend in the loops and get the formation to look good. 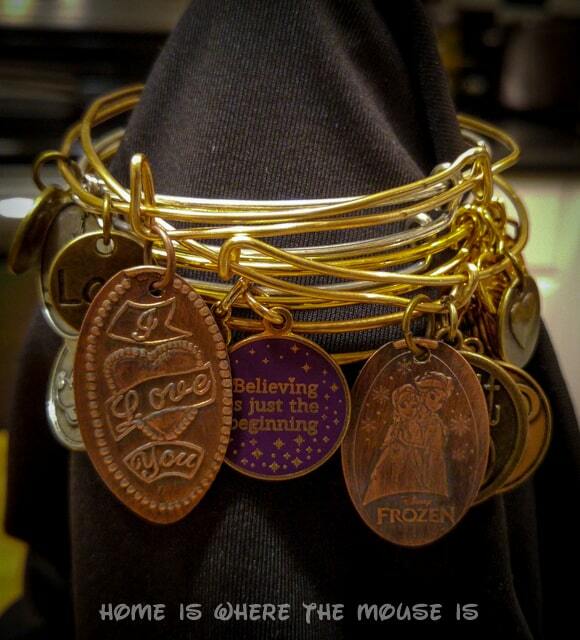 I finally went back to Hobby Lobby and bought the already-manufactured bracelets and added the charms. Since I wanted to use sterling silver, you’ve inspired me to use dead soft and I’ll put them in the tumbler to work harden them before adding the charms. I’ll let y’all know how they turn out! Thanks! I wonder if I just have to work on my work-hardening technique? I can see how the loops would be tougher with half hard wire. I have been meaning to make a few more, and we have a trip coming up, so I can stock up on pressed pennies. Can’t wait to hear how yours turn out.